Huh? What kind of bird is that? It's autumn, and apples have begun to fall, although many remain on the trees. 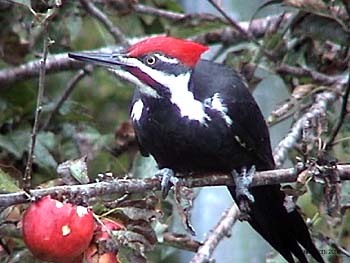 In full view of its offspring, an adult Pileated Woodpecker stabs a tasty apple treat. After it feeds, it flies to a nearby tree. Alone now, the youngster repeats what it's seen, knocking apples to the ground until it finds one secure enough to withstand its hungry blows. It just learned something that will sustain it, once it's on its own. Hey, perhaps they should be called Pileated Applepeckers at this time of year! It’s autumn, and apples have begun to fall. Our daughter calls from three thousand miles away seeking grandma’s recipe for an apple pie. From a worn, 3X5 card, I read words written many years ago in fine, clear penmanship. 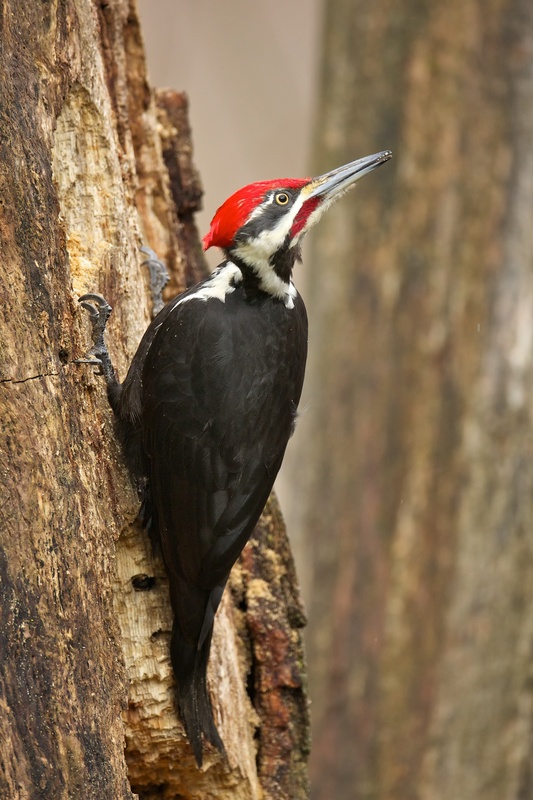 They are Pileated Woodpeckers, the flamboyant kind that inspired the look of Woody Woodpecker. They have black and white bodies and large, chiseled heads with prominent red crests. The adult’s topknot is fire-engine red, the younger one’s more muted, like the red of a tomato not yet fully ripe. In full view of its offspring, the parent stabs the tasty apple treats, then after feeding, flies to a nearby tree. Alone now, the youngster repeats what it’s seen, knocking apples to the ground until it finds one secure enough to withstand its hungry blows. 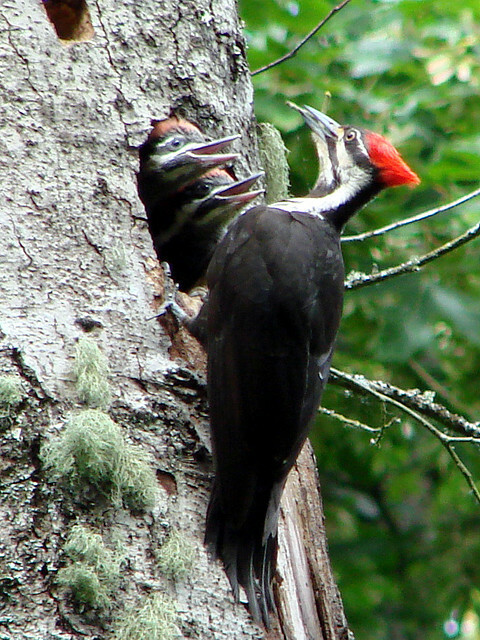 Light pecking of Pileated Woodpecker provided by The Macaulay Library of Natural Sounds at the Cornell Lab of Ornithology, Ithaca, New York, recorded by G.A.Keller. 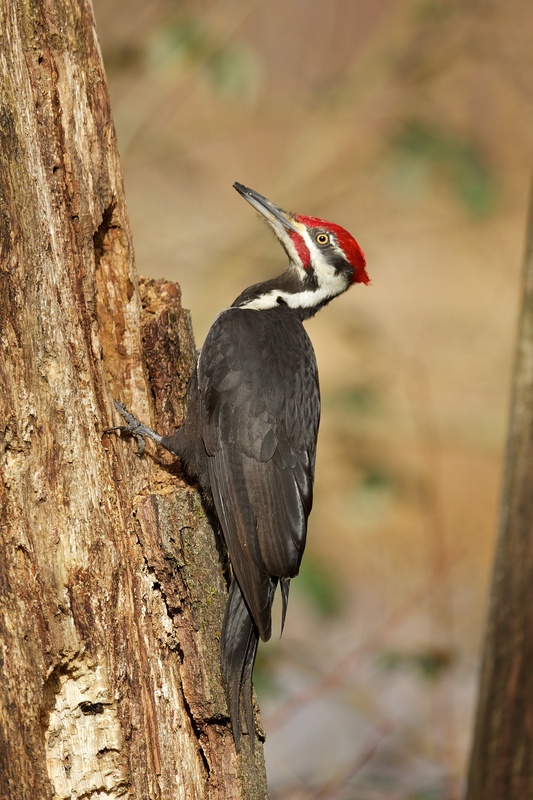 Call of Pileated Woodpecker and ambient from 0705G5T1 recorded by C. Peterson. 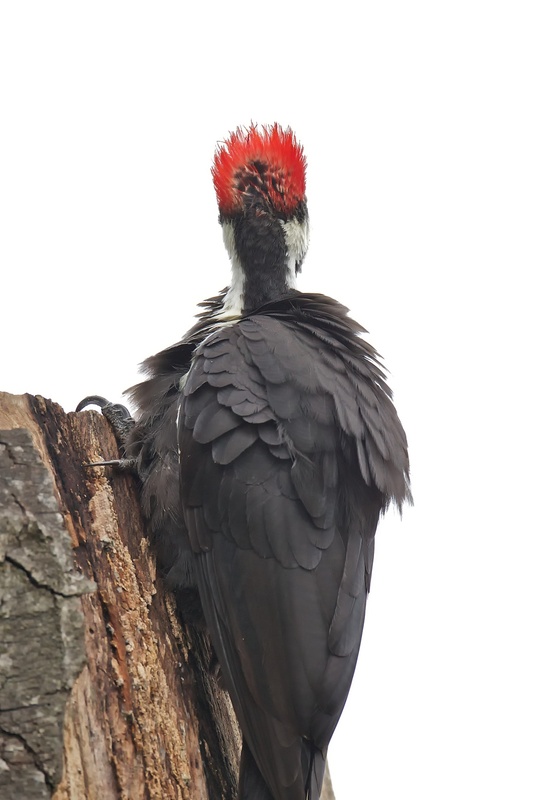 Check out this video of an actual Pileated apple-pecker!